“Side Effects,” which opens on Feb. 8, 2013 and is rated “R,” also stars Jude Law, Catherine Zeta-Jones, Rooney Mara, Mamie Gummer, Carmen Pelaez, Marin Ireland, Polly Draper, Haraldo Alvarez, James Martinez, Vladimi Versailles, Michelle Vergara Moore and David Costabile from director Steven Soderbergh and writer Scott Z. Burns. To win your free “Side Effects” passes courtesy of HollywoodChicago.com, just get interactive with our unique Hookup technology below. That’s it! This screening is on Monday, Feb. 4, 2013 at 7 p.m. in downtown Chicago. The more social actions you complete, the more points you score and the higher yours odds of winning! You must be 17+ for this “R”-rated screening. 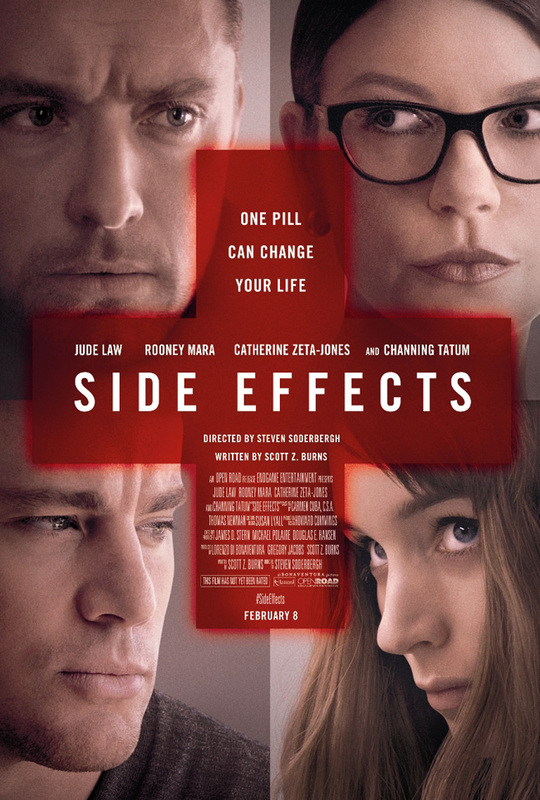 “Side Effects” is a provocative thriller about Emily and Martin (Rooney Mara and Channing Tatum). They’re a successful New York couple whose world unravels when a new drug prescribed by Emily’s psychiatrist (Jude Law), which is intended to treat anxiety, has unexpected side effects. The movie poster for “Side Effects” starring Channing Tatum and Jude Law. The movie trailer for “Side Effects” can be watched now below. This HollywoodChicago.com Hookup is simple! Just get interactive in our unique Hookup technology above. We will award 40 admit-two movie tickets based on social entry numbers and/or randomly via e-mail for our “Side Effects” Hookup. Good luck!